Grand Coulee could very well be the most magnificent example of a receded cataract gorge on the planet. The coulee in its entirety is actually two canyons whose total length is nearly 50 miles from north to south. Upper Grand Coulee is approximately 25 miles in length and is separated from the lower coulee by an unexcavated section roughly mid-length of the whole feature. The width of the coulee varies from about one mile to about five miles in width at its’ widest section, with an overall depth of about 800 to 900 feet. Upper Grand Coulee heads at the Columbia River valley at the site of the modern Grand Coulee Dam. The coulee head forms a notch on the south wall of the Columbia Valley, and with an elevation of some 1550 feet, lies about 300 feet above the elevation of the present day Columbia River. Upper Grand Coulee now serves as a reservoir for the storage of water drawn from the Columbia River at the Grand Coulee dam site. Another dam built at the southern end of Upper Grand Coulee, about 1¾ mile above Dry Falls Cataract, retains this body of stored water which now goes by the name of Banks Lake. The creation of Grand Coulee is generally attributed to a diversion of the Missoula Flood waters by the damming of the Columbia River valley west of the area of Grand Coulee dam by the Okanogan Lobe of the Cordilleran Ice Sheet. Crab Creek Coulee is the east-west trending spillway that carried overflow from the main flood reach responsible for carving out Cheney-Palouse scabland. 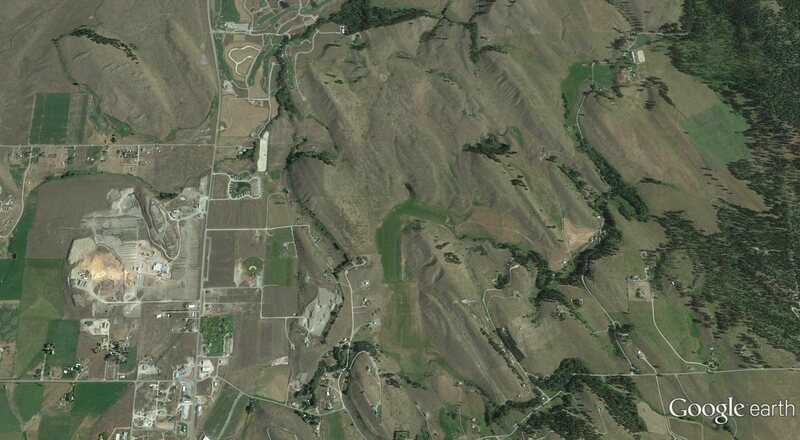 It is a stark indication of the prodigious volume of floodwater pouring south over the rolling Palouse, water which completely overwhelmed the pre-flood stream divides. Crab Creek Coulee is the largest of some five major east-west spillways flowing westward out of and away from the main flows that created Cheney Palouse scabland. It shows up in satellite photographs quite prominently, being the large horizontal dark band that intersects the southern reaches of the Telford scabland. 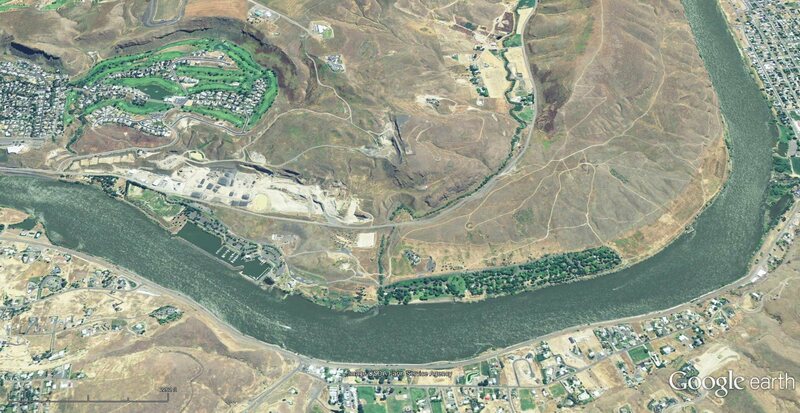 In reconstructing the flood chronology it would appear that at the southern end of Billy Clapp Lake floodwaters emanating from Grand Coulee, Telford Scabland and Cheney-Palouse all merged to flow together into Quincy Basin. The Cheney Palouse Scabland is the easternmost tract of scabland. 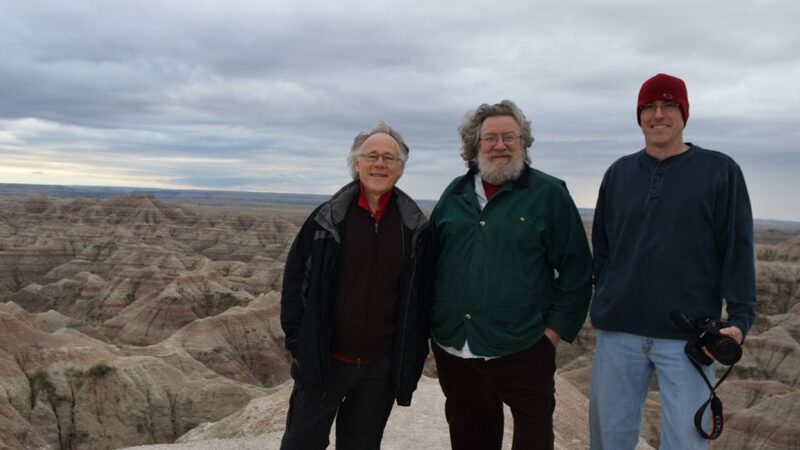 It takes its name from the town of Cheney, Washington, which is located near the drainage divide that marks the head of the tract, and from the rolling Palouse loess landscape across which it passes, which in turn takes its’ name from the Palouse River. 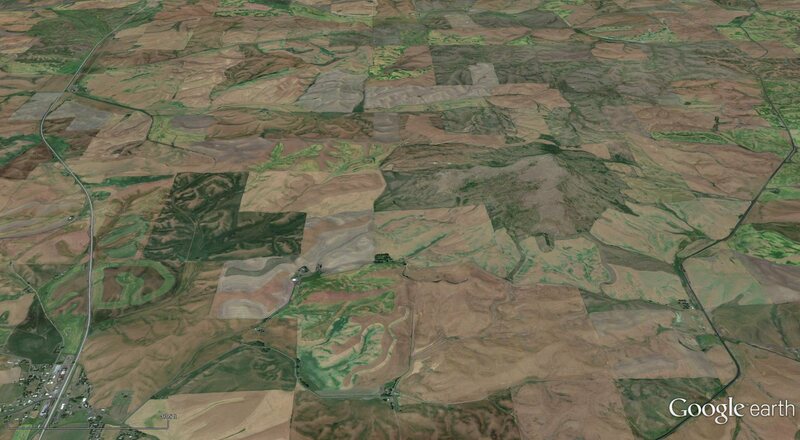 The Cheney-Palouse scabland tract is the greatest feature of its kind on earth. It is the type specimen for the definition of Channeled Scabland. From east to west the tract is some 20 miles wide and from its beginning at the latitude of Cheney to its terminus at the confluence with the Snake River to the south is about 75 miles. Within the Scabland area are islands of loessial soil that escaped being entirely washed away by the raging currents. The entire complex occupies an area of approximately 1,500 square miles. Once the waters reached the Snake River they flowed up the valley as well as down. The waters that flowed down the Snake to the west discharged from the mouth of the Snake adding to the inflow into Pasco Basin and contributing to the formation of Lake Lewis. 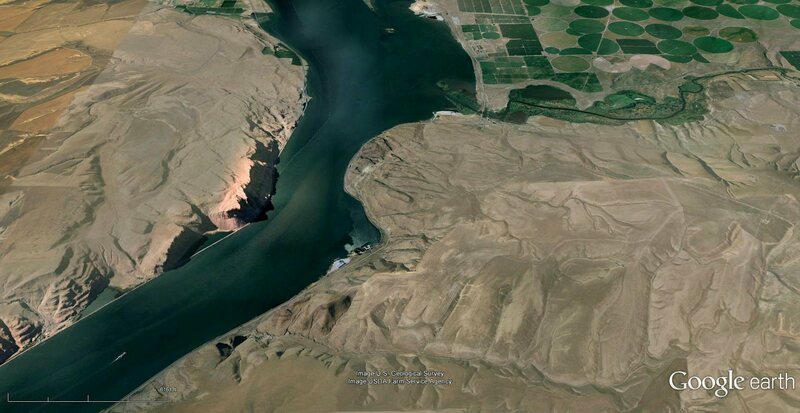 The waters that flowed up the Snake created a huge silt-laden backwash that reached all the way beyond Lewiston, Idaho, building sedimentary beds almost to the mouth of Hell’s Canyon. At the most distal point of flow the waters reversed direction and flowed back down the Snake to rejoin the rest of the floodwater accumulating in Pasco Basin. 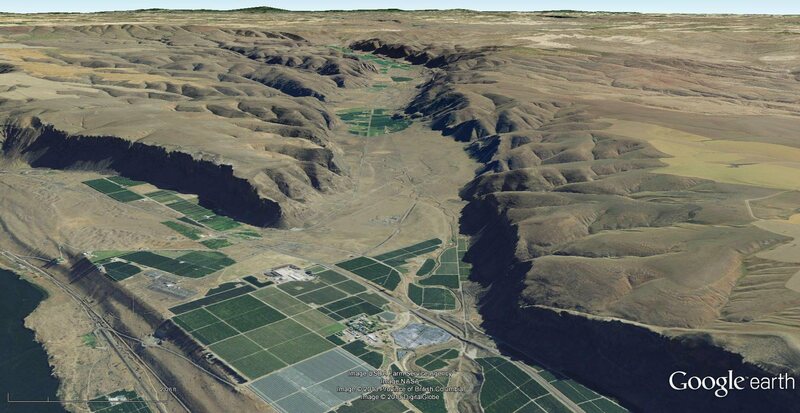 As the water rose to nearly a thousand feet behind Wallula Gap on Pasco Basins’ southwestern rim, it back-flooded into all the tributary valleys such as the Walla Walla valley and the Yakima valley that adjoined it. 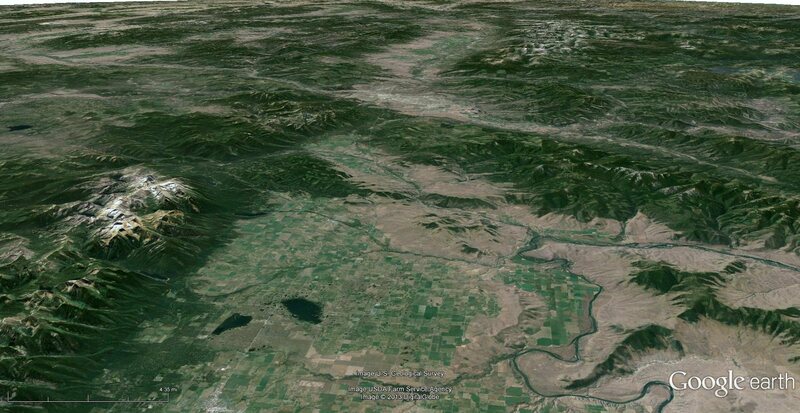 The back-floods deposited the layered rhythmites seen at exposures in Burlingame Canyon, Zillah, Touchet, Mabton and numerous other locations. Toward the southern section of the Cheney-Palouse Scabland tract the gradient became steeper. This caused an increase in erosive potential of the flood-waters that increased the depth of scouring. The Palouse Canyon was the major byproduct of the intensified erosion. The underfit condition of Palouse Falls cataract is a clear indication of the power of the flood flow. One consequence of the flood was that the channel of the pre-flood Palouse River was completely diverted from its former route, which passed down the [channel now called] Washtucna Coulee. The diversion took place very near where the town of Washtucna now stands. Prior to the Missoula flood the reach now occupied by Palouse Canyon was the divide between the pre-flood Snake and Palouse Rivers. In other words, the floodwaters so completely overwhelmed the pre-flood Palouse River channel and valley that the waters spilled over the divide to the south cutting a new channel completely across it. 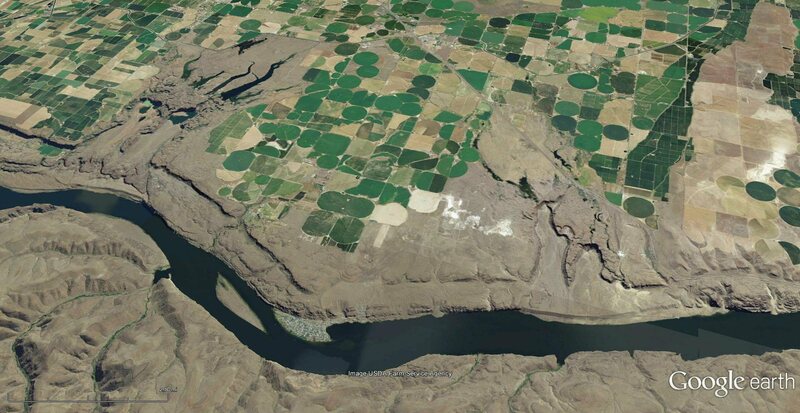 It is this superimposed incision that the modern Palouse occupies, from the diversion point at Little Palouse Falls to its confluence with the Snake about 9 miles to the south. 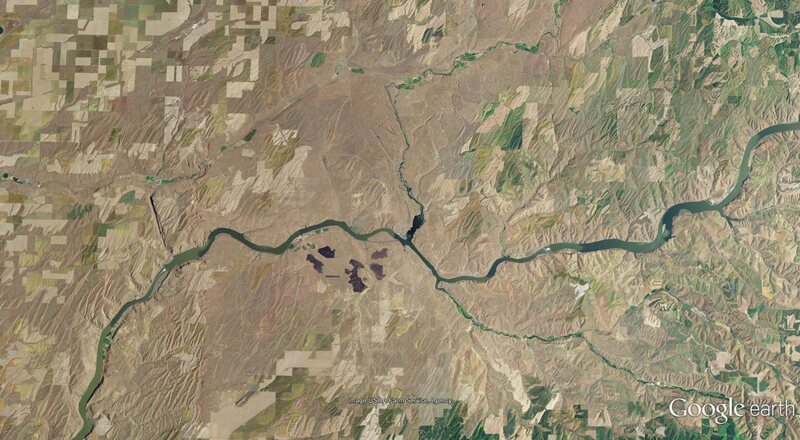 [ ] Water discharging from the mouth of Palouse canyon diverged up the valley of the Snake as well as down. 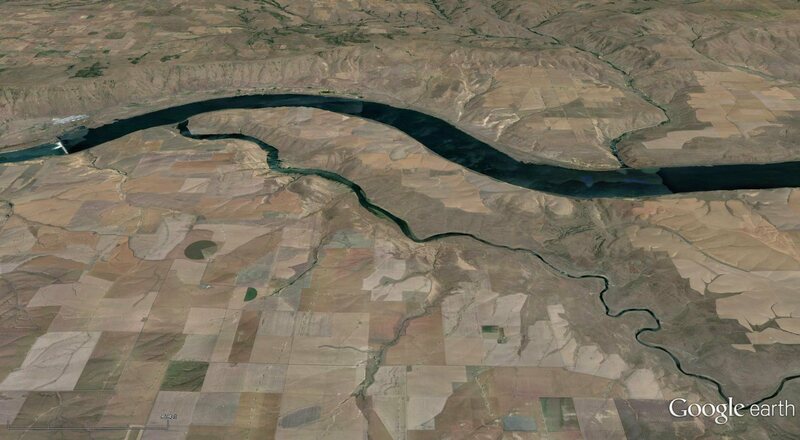 Two massive gravel bars corresponding to this flow divergence project from the mouth of the Palouse, one of them trends upriver towards the southeast and the other downriver, towards the west. The relationship will become clear by reference to the map. This is outwash from the erosion of Palouse Canyon. The gravel bars display giant ripple trains on their surfaces. Another spillover canyon further downstream is Devil’s Canyon. Like Palouse Canyon, Devil’s Canyon formed as the result of the incapacity of the pre-flood Palouse River to convey the incredible volume of floodwater, forcing the water to spill over the existing divide separating the Palouse from the Snake Rivers. Unlike Palouse Canyon, Devil’s Canyon is not presently occupied by a stream or river. The present day Palouse Falls is a diminutive remnant of the waterfall that gouged out this cataract and scoured the surrounding bedrock. During the peak of the floods this entire scene was overwhelmed with raging currents pouring off of the Cheney-Palouse scabland tract. The canyon at this location is about 400 feet deep. The scouring on the bedrock adjacent to the canyon implies that the canyon flowed at least brimful. 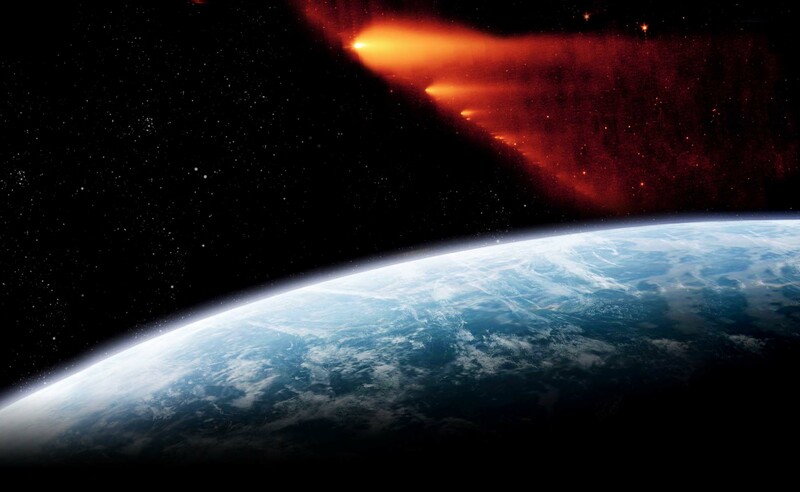 The most likely scenario is that there existed a pre-flood zone of weakness, perhaps a fault line, along which the floodwaters concentrated to erode the canyon. 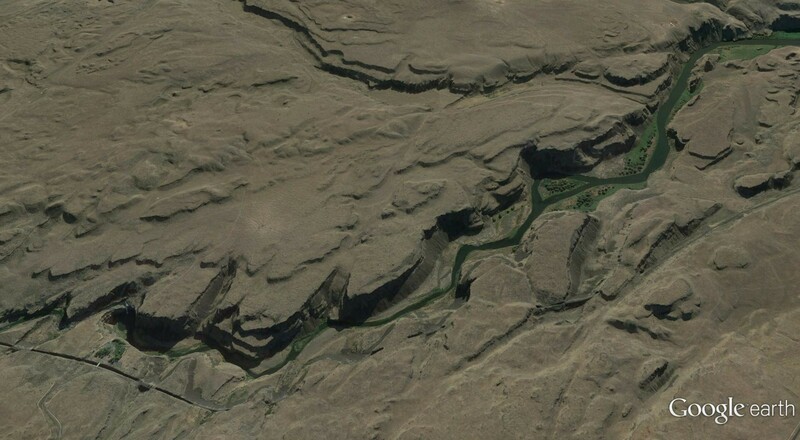 Only some of the water passing over the Cheney-Palouse region contributed to the formation of this canyon, the remainder passed southeast along a route corresponding to Washtucna Coulee, which was actually the channel of the pre-flood Palouse River. The Rolling Palouse: hills of fertile, wind-blown silty material called loess, probably accumulated over several ice ages. Thickness of the deposits ranges up to 250 feet. Large volumes of the Palouse loess were swept away during the course of the Missoula Floods, most especially in the area of the Cheney-Palouse scabland. 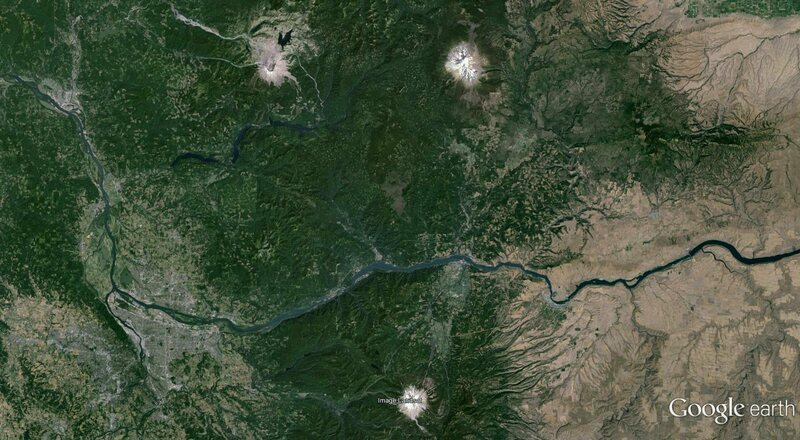 It is this material that forms the teardrop shaped islands against the background of dark exposed basalt, seen so readily in the aerial and satellite photos of eastern Washington. 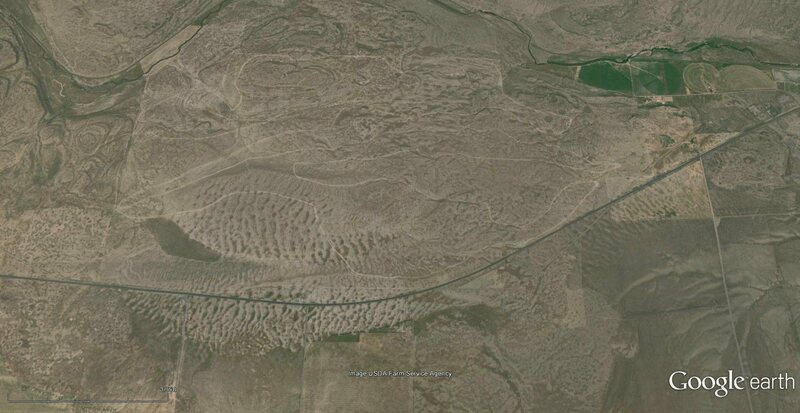 The “stormy sea” topography, as it has been so called, probably results from its temporary immersion in sluggish flood-waters during the greatest of the Missoula floods, possibly due to excessive rainfall associated with the flooding. Tammany Bar gravel and silt deposits. This is a truly remarkable deposit, found along the East bank of the Snake River at its junction with Tammany Creek, just south of Lewiston, Idaho. What makes this exposure so valuable is that it displays deposits from the two most powerful floods known in North America in one outcrop. Clearly visible are the two distinct sedimentary provenances, gray colored coarse gravel deposits overlain by a finer grained, buff colored silt. The coarse gravels forming the lower layer are deposits of the great Bonneville flood, originating from the overflow of Lake Bonneville, over 400 miles to the southeast in Utah, and the juxtaposed silts were deposited by Missoula back-floods originating, presumably, from the overflow of Lake Missoula in the region of Lake Pend Oreille, Idaho, some 120 miles north of this site. 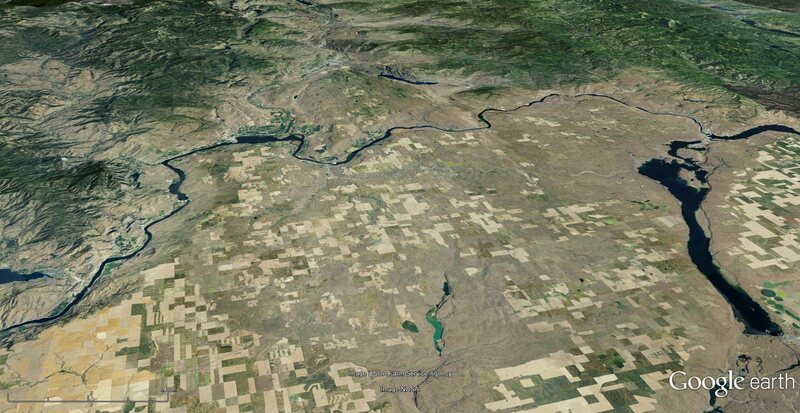 (Purcell Trench in northern Idaho and southern British Columbia) This great north-south trending valley seen along the center of this digital map plays a central role in developing a detailed model of the Missoula Floods. Evidence supports the conclusion that the Purcell Trench was filled with a glacial lobe of the Cordilleran Ice Sheet. 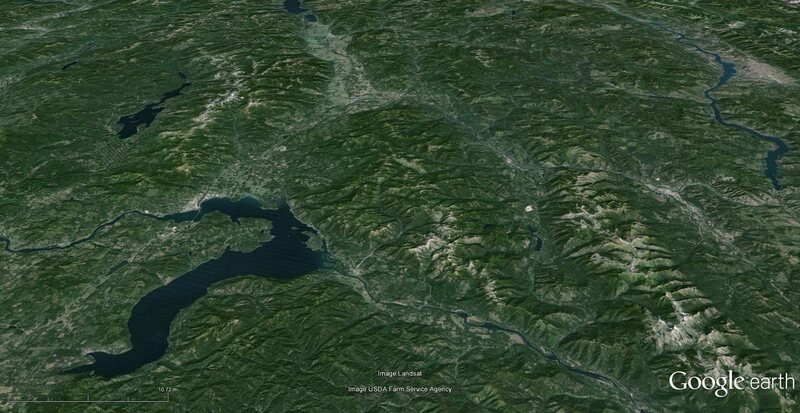 The ice extended into the basin now occupied by Lake Pend Oreille, seen at the bottom [left] of the image, and apparently pushed on about another 20 or so miles beyond the southern edge of that lake. 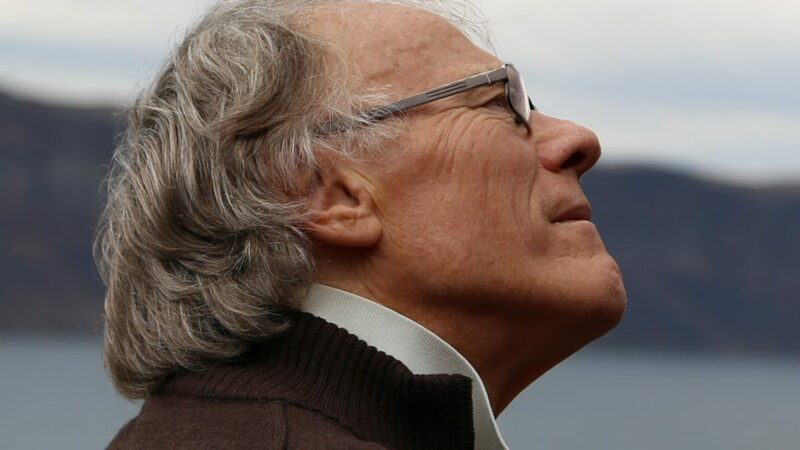 It is this lobe which is presumed by the prevailing flood origin theories to have formed the obstruction to the westward flow of the Clark Fork River, thereby damming the river and forming Lake Missoula as a consequence. We believe that the field evidence supports the conclusion that this north-south trending valley carried enormous amounts of meltwater that discharged south through the Spokane Valley below Lake Pend Oreille and contributed as much to the formation of the Channeled Scabland as water issuing from the valley of the Clark Fork. The north flowing Kootenay River can be seen meandering across the floor of the trench in the upper part of the picture. Lake Pend Oreille (pronounced ‘pond-a-ray’) [where the Clark Fork River enters is] the presumed site of the ice dam. 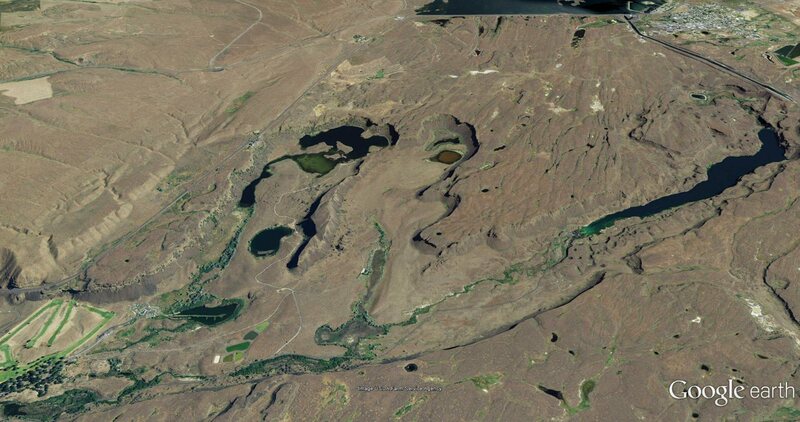 [Lower center of image] While there is no doubt that the basin of this lake held a large lobe of glacial ice, usually called the Purcell Trench lobe after the wide valley into which the north end of the lake opens, we question whether this ice ever actually served to retain the water of Lake Missoula for any extended period of time. 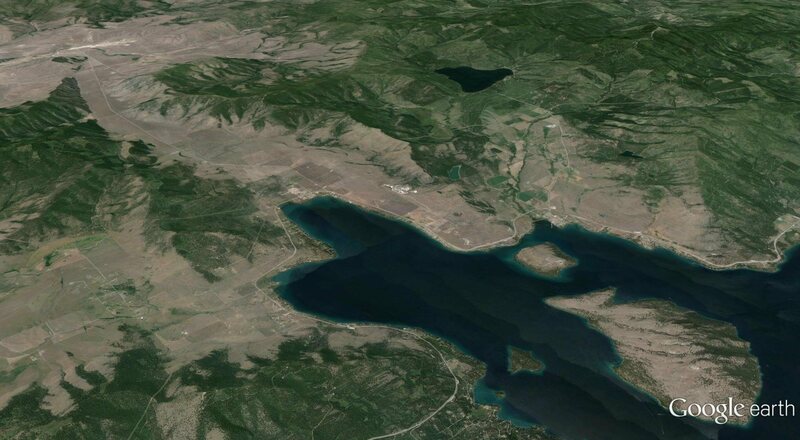 The position of the glacier/lake interface is usually assumed to be in the region of the Cabinet Gorge dam, almost on the Idaho/Montana state line. 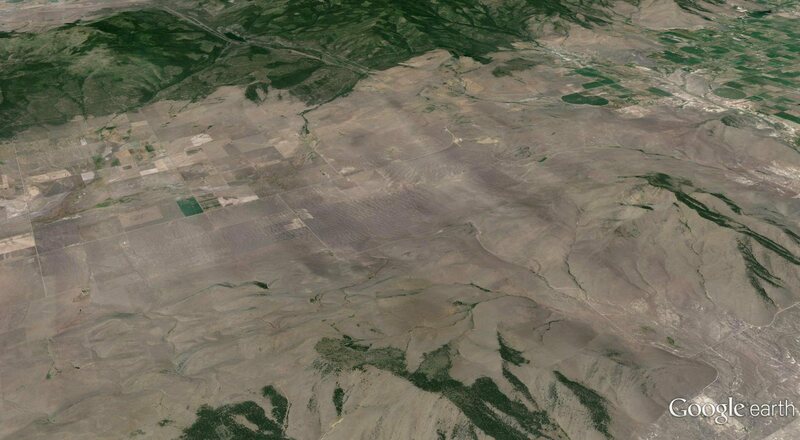 (Aerial view looking west NW over the Camas Prairie current ripple field) In this view one can clearly see that the magnitude of the ripples, both amplitude and chord length, diminishes to the south. This is inconsistent with Missoula Flood orthodoxy, which maintains that the water filling the basin drained to the south. A study of the topography in the vicinity of the southern outlet shows that flow should have accelerated, as the flow channel both contracted in width and increased in gradient. From the northern end of the basin, at the head of the current ripple field, to the south in the vicinity of the basins drainage outlet is a distance of about 7 miles. The gradient over this reach is essentially zero, being about 2,850 feet above sea level across the entire basin floor. 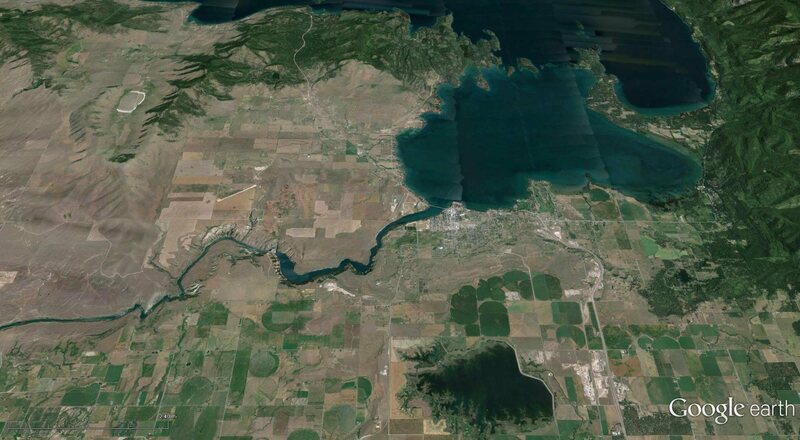 From the head of the southern outlet of Camas Prairie basin to the present day Flathead River is about 4 miles, over which the elevation drops to about 2,475 feet above sea level. This is a gradient drop of over 90 feet to the mile. So, as the water reached the southern end of the basin it was not only entering a channel with reduced width but steepened gradient as well. With this topographical configuration flow velocity, and hence stream power, would have increased as it approached the outlet, not decreased. However, the current ripple field shown above shows a diminishing stream power. This is only consistent with a current flow entering the basin from the north and declining in power as it passes to the south, in this case the same current which flowed off the flank of the Flathead lobe of the Cordilleran Ice sheet, cutting Chief Cliff as it poured west down Big Draw, then south through the Little Bitterroot Valley, augmented by meltwater flows emanating from Salish Mountain glaciers on the north end of the Little Bitterroot, and over the low range of hills defining the northern rim of Camas Prairie, eroding Duck Pond, Markle and Wills Creek passes in the process. It was these unnamed hills which provided both the velocity-retarding obstruction to the current flow and the sediment supply to construct the rippled delta like fans extending off their southern, or down-current faces. A silt layer lying on top of the coarse gravel that forms the bulk mass of the current ripples indicates the actual more prolonged drainage of the basin. Consistent with a decreasing current velocity towards the south is the fact that the silt layer tapers from nothing at the north end of the basin to six feet in thickness towards the southern end. Rainbow Lake[:] Massive currents emanating from Camas Prairie Basin poured through this pass from the east. Based upon the elevation of scoured rock surfaces one can estimate that the water flowing through the pass was somewhere around 500 feet deep. The elevation of the pass near the lake is about 3,600 feet above sea level. 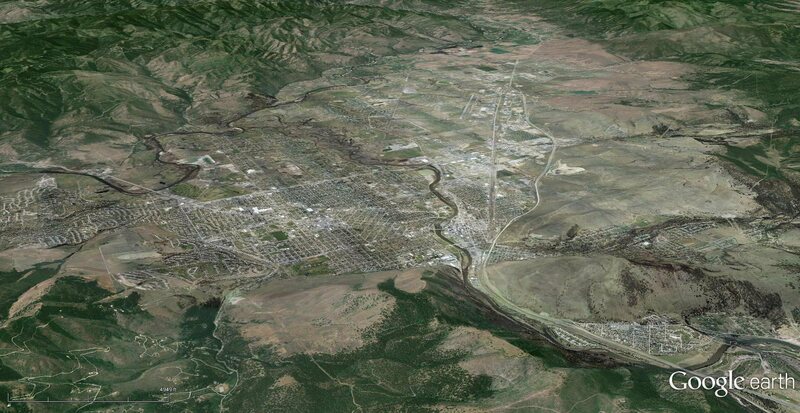 The maximum elevation of Lake Missoula was about 4,200 feet above sea level, which is consistent with the level of rock erosion on the hillsides. Markle Pass, (pronounced ‘Marko’) view to the north. This was one of three spillways into the north end of Camas Prairie basin. 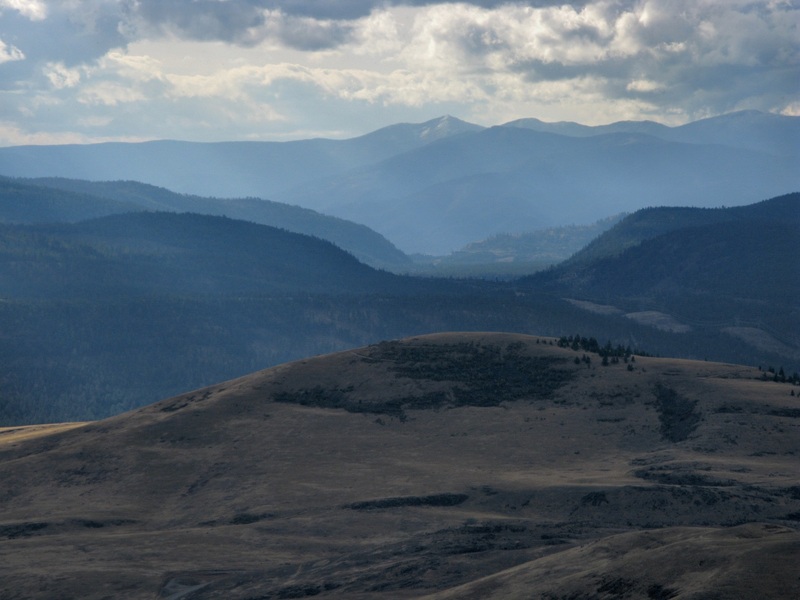 A low range of hills separate the Little Bitterroot basin to the north, from Camas Prairie to the south. The flood water pouring over these hills caused severe erosion as well as slowing of the current. This resulted in the deposition of the massive rippled gravel deposits and delta type formations below the hill complex. The highway going through the pass is State Route 382. Just south of the curve is a pull off zone from which the entire current ripple field is magnificently displayed. The bend in Highway 382 is about 3,320 feet above sea level, which means the water would have been nearly 900 feet deep as it poured over and through the pass. Chief Cliff, a local landmark, is a product of extreme current flows passing between the west margin of the Flathead glacial lobe and the eastern flank of the Salish Mountains, in the process creating what is essentially a truncated spur. Chief Cliff is a significant feature whose presence is not consistent with the prevailing model of a draining glacial lake. The summit of the cliff stands at about 4,150 feet above sea level, or almost exactly the presumed level of Lake Missoula whenever it reached its maximum volume. But at this location the Big Arm sub-lobe of the Flathead lobe separated the cliff area from the lake by some five miles of glacial ice. In other words the lake did not even reach the area of the cliff. Assuming that Lake Missoula drained out in the region of Lake Pend Oreille, some 180 miles, by water, to the west, there is no reason to assume catastrophic current flows here. Rather it would be a fall in lake level against the southern margin of the Flathead glacier. The erosive flows that created Chief Cliff had to have come from the north, flowing into, rather than out of, the Flathead Basin. This implies that that the ultimate source of the Missoula Flood water was to the north, issuing from melting glacial ice of the Rocky Mountain Trench in British Columbia. The Elmo Moraine was the product of the Elmo Sub-lobe of the Flathead Lobe of the Cordilleran Ice Sheet. The moraine can be seen as the hummocky deposit immediately to the west of the Big Arm Bay. State Route 28 passes through a breach in the moraine produced by water from the melting Flathead glacier lobe. Water also drained around the northern edge of the moraine between it and the Hog Heaven Range, creating scabland type erosion. Note the location of Chief Cliff. A large scale flood current flowed west through Big Draw to eventually contribute to the creation of the Camas Prairie giant current ripple field. Looking west along Big Draw. This valley was a conduit for the flood waters pouring past Chief Cliff. At the conclusion of the flooding vast amounts of sediment were laid down into the channel trough forming this relatively flat valley floor. Just beyond the hill in the middle ground the flowing water turned south in the direction of Camas Prairie. The highway is State Route 28. The effect of catastrophic flood scouring is prominently displayed on the south side of Big Draw in the contouring of the bedrock hills. The irregular hills immediately south of the lake comprise the Polson Moraine, which marks the southern extent of the late Wisconsin Cordilleran Ice in the Rocky Mountain Trench. 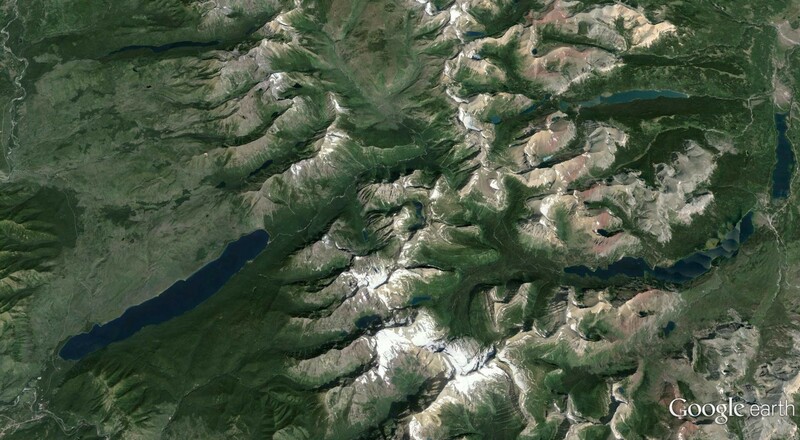 This southern margin of the glacier would have formed the northern shore of Lake Missoula, against which the water would have stood over 1000 feet deep. We question the veracity of this model of a static body of water restrained only by glacial ice. The question of the source of such a massive volume of water has received far less attention than it deserves. It can only have derived from rain water, glacial melt water, or both. Either scenario is beset with problems. The question must be raised: If the climate is warm enough to support copious rainwater, or melt-water, enough to virtually fill the entire catchment basin, how is it possible for that same climate to sustain massive, absolutely stable glacial masses capable of retaining water pressures in excess of 900 psi? We think it is time to go back to the drawing board. West Glacier entrance near Lake McDonald at the lower left. Going to the Sun Road thru park travels along lake, up to Logan Pass and back down along St. Mary Lake to East Glacier, then reconnects with Route 2 onto the prairie.